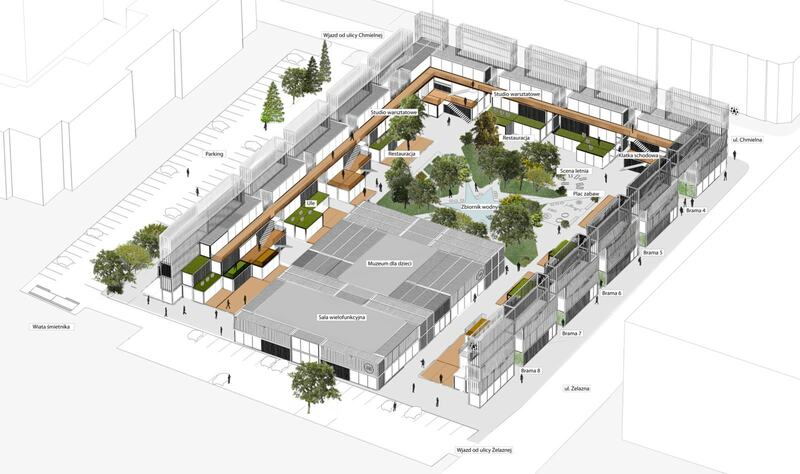 Implant is a temporary leisure/shopping/culture complex to be built with construction site containers. 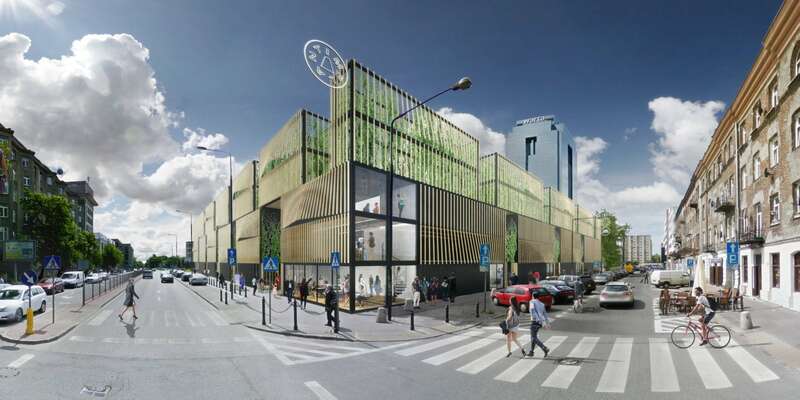 It will be located on the verge of Śródmieście (Downtown) and Wola districts in Warsaw, Poland. The plot is an empty space adjacent to two once important streets: Żelazna street that constituted the backbone of pre-war Jewish district and Chmielna street. WW2 has left this zone in bad shape, both when it comes to space (half or completely ruined pre-war tenement houses) and social tissue (original inhabitants killed or dispalaced, rural population moved in as replacement to work in heavy industry built in the 1950-ties). Since liberalization in 1989 Wola has become an attractive space for developments, especially large office buildings with permitted height up to 200 meters. At the same time many lots and buildings that were nationalized with so-called Bierut decret in 1950-ties remain vacant because of ongoing reclamation procedures. This situation has created a characteristic landscape of new tall office buildings emerging from ruins inhabited by empoverished working class, lumpenproletariat and artists. Wola offers a proximity to city’s center mixed with low rents and the presence of culture clubs and bars (cult bar Chłodna 25 among others) and artistic interventions commemorating district’s Jewish past, such as an art installation recalling the infamous ghetto footbridge depicted in Steven Spilberg’s „The pianist” and Keret House nicknamed „the narrowest house in the world”. 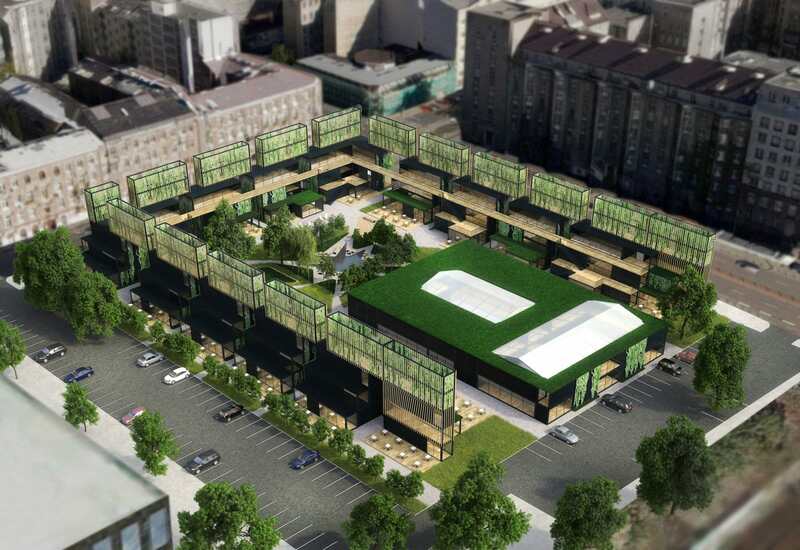 Żelazna street is regaining it’s importance with new large-scale projects taking place along it, including the refurbishment of Norblin factory (the oldest XVIII century factory in Warsaw) that will contain high level apartments, offices and the biggest organic food market in the city. The contemporary social mix creates a lot of friction and diversity of functions reflecting the needs of the users and inhabitants of the zone. Generic coffee parlors servicing office workers coexist with culture clubs, while small chain groceries and foodstores stand door-to-door with farmer markets, hardware stores and cabinetry, carpentry and upholstery workshops. Many of the remaining pre-war buildings were turned into communal housing inhabited today by the elderly, students and unemplyed third generation of derooted ex-countryside workers. Pockets of new restaurants emerge on streets perpendicular to Żelazna, especially Elektoralna, where tourists from Israel and other countries appear in search of the remnants of Jewish ghetto. Many buildings are post-war prefabricated coops built for various professional / union groups who’s original owners still remain in these appartments. Chmielna 75 plot was once a densely built location out of which nothing is left, except for a derelic wall and betula trees planted after the war. IMPLANT is in fact a way to prototype the space and functions for the future, where according to the authors of the project, an open green courtyard should create a lively contrast to dense urban tissue of Wola, since the most proximate parks are at least three kilometers away). 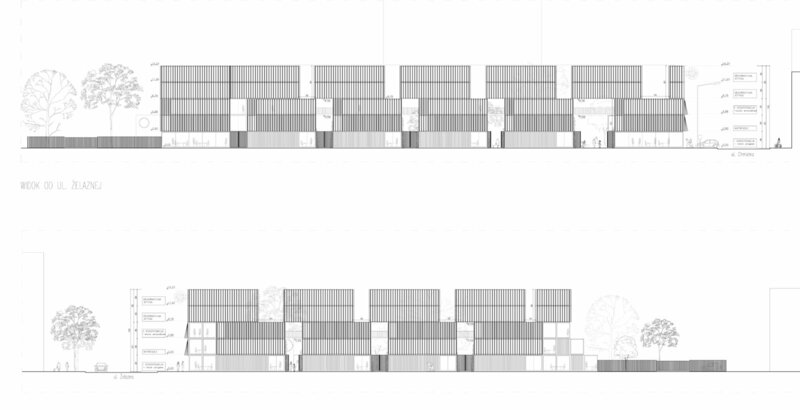 The courtyard will be surrounded with three urban „walls” reconstructing the perimeter of the lot as it was before the war with a height of five stacked-up containers of approximately 14,5 meters. These „walls” are divided into smaller sections providing gated access spaces to the interior of the lot and introducing cortyard’s semi-natural character with ivy planting („green tunnels”). The lot is accessible by car to a parking lot running along it’s southern and western border. The southern end of the lot touches the mouth of a railway tunnel leading to Central and Western stations (European grade east-west line linking Berlin and Moscow). According to Polish regulations a temporary building should not be higher than two soreys, while the clearly expressed oppinion of Warsaw’s Chief Architect calls for a height representing a reference to the facades of buildings located on the other side of Chmielna street. For this reason the building has three levels: the groundfloor with bars and restaurants, a mezzanine level representing less than 50% of groundfloor’s usable floor area and the first floor with a gallery running along the three facades that distributes the visitors to studios, shops and other services. Vertical division of functions represents the synergy between culinary consumption taking place on the groundfloor, either inside or outside the bars, while more qualified functions attract people who have special intrest in visiting furniture designers, craftsmen and artists located on the first floor. 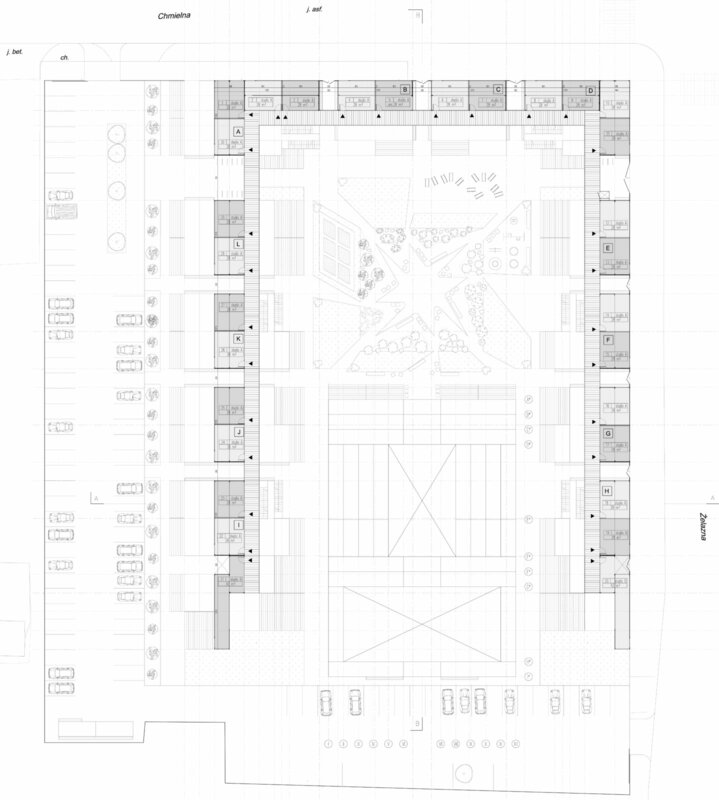 The lot is enclosed from the southern side with a lower building containg a multi-functional space for concerts, exhibitions and other events and a pop-up children’s museum accessible from the courtyard. The mix of bars, studios providing obligatory workshops for different age groups and large functions (children’s museuma and multi-functional indoor space) will create a mix of users that will come to the complex due to varied motivations. The first one will start with lunch-time and after-work meetings during the labour days and on weekends. The second one will be related to shopping designer goods produced on-site by young fashion, furniture, graphic and other designers and looking for basic services (key-copying, printing, shoe-repairing, etc.). The designers will be involved in everyday educational programming by providing spaces and tutorship to people intrested in professional workshops held once or twice a month by each designer. The third one will be related to occasional / periodic users of children’s museum that will offer extra-scholar education to kids from three to eighteen years, both during labor days and on weekends. The fourth one will be related to the multi-functional space that will attract wider target group of users coming from outside of the district to participate in concerts, exhibitions, promotional events or fashion defilees. 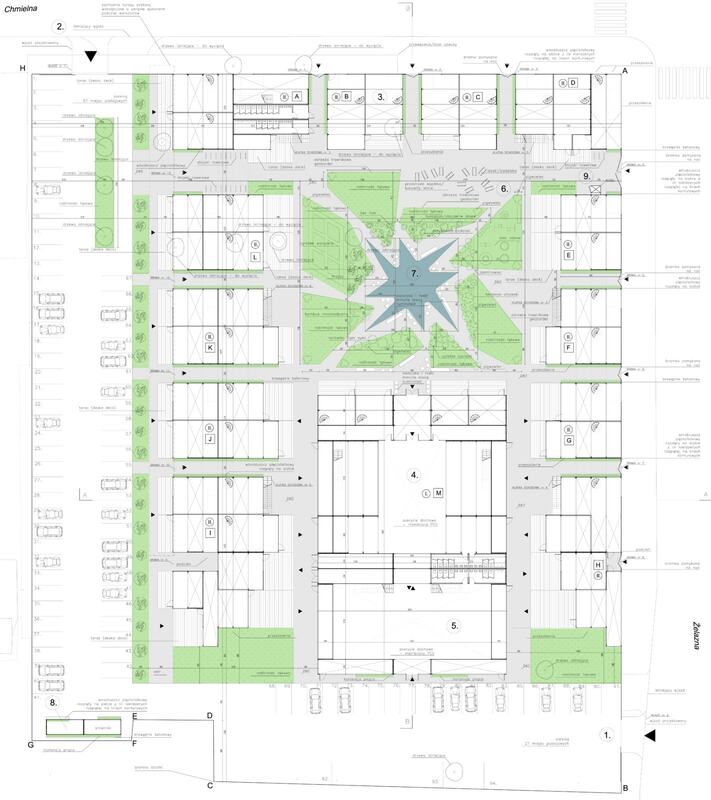 All these people will have an opportunity to mingle in various spaces of the green courtyard that will offer the function of a food-court, playground, silent „niches” between high trees, urban farming space and benches along the pond in the center.